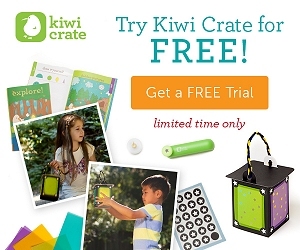 Home / Freebies / Free Stuff Online / Free Kiwi Crate Trial Box! Just pay Shipping! I have a great new FREEBIE for you today! Right now you can get a Free Kiwi Crate Trial Box which includes tons of great DIY projects for you and your kids! This awesome Free Kiwi Crate Trial Box includes everything you need to make a starlight lantern, a full set of vellum sheets as well as glow-in-the-dark star stickers. It also includes kid-friendly star hole punch, a tea light and a 16 page explore! magazine that includes DIY activities, a Firefly project and puzzles. Grab this great trial box today and all you’ll have to do is pay $3.95 shipping and you’ll get this amazing craft box delivered to your door! Eye Shadow Palette| Get Paid to Test this Product for FREE!